Our beautifully made drink and dinner carts feature a handsome wood laminate finish, a durable black metal frame, and sturdy rolling casters. 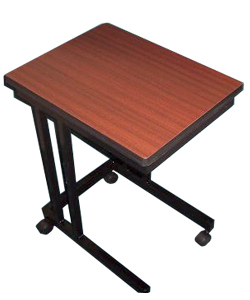 The Table-Side Drink Cart features two inset drink holders, and it measures 18 x 10-3/4 x 21-1/2 inches. 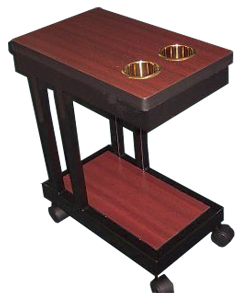 Our Poker Meal Cart with a solid top (without drink holders) measures 21-1/2 x 16-1/2 x 27-3/4 inches.